Are you taking advantage of the after the holiday sales? I’ll be honest, I really don’t need any more Christmas things and besides, I like to find the little treasure here and there throughout the year while thrifting. However, there are certain things I look for that can be used through the year or at the next holiday. One thing that I look for is those cute little girl’s gift sets (bubble baths, lip balms, jewelry etc.). The Princess’s birthday is January 8th, so these 50% off sets make nice birthday presents for her. This is also a good time to stock up on these kinds of things if you have little ones (or grandchildren) for Easter basket stuffers. This is also the best time to stock up on candles! And another thing to look for is the pretty wired ribbon. Not all of them look Christmasy. And look for solid color rolls of gift wrap to use all year long. And then there are things like chargers. I picked up these green ones for St. Paddy’s day at Walmart for .49 cents each. They had red, silver and gold. These are basic colors to use all year. Keep in mind, you can spray paint or redesign these thrifted chargers! Check out my experimentation on painting chargers at this post! And don’t forget about Christmas candies such as Kisses, Hershey mini candy bars or M&M’s. These are great to add to you baking supplies! So, think outside of the box when you see these clearanced holiday things. They can save you some money down the road. Let’s look at some fun posts from last week! Kim at Musings from Kim K. shared her (and her hubby) redo of this cute thrifted jelly cabinet. Liz at Shortbread & Ginger shared some fun thrift finds. And Pyrex lovers, did you see the Pyrex Ann at A Sentimental Life got at an auction? Thank you ladies! Here is the “I was Featured” button for your blog! Remember to link back this this party on your post! 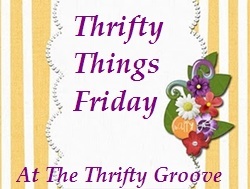 I never feature posts that don’t link back to The Thrifty Groove. 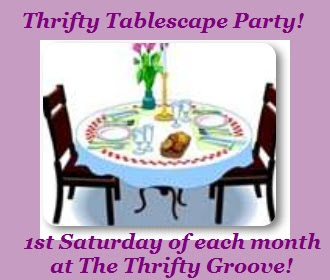 Don't forget, this Saturday (Jan.7) is the first monthly Thrifty Tablescape Linky Party of 2012! I would love to see you there! Okay, let’s see what you have to share with us this week! ABSOLUTELY great ideas about planning ahead for St. Patricks, Valentines and Easter. I do the same thing with ribbon, candles, etc. I also BUY my perfume at after Chruistmas sales. I picked up a 1 ounce bottle that came in a set with hand cream and bath gel for less than $5. They're selling the 1 ounce bottle alone, non Christmas stock for over $45. GREAT deals to be had, out there. I am really trying not to spend any money unless I really need something, but I may be 'forced" to buy some of those chargers at that price. I found some at GW and they wanted $1.99 hah! Great finds! Very pretty features too. Thank you for hosting and for having me honoring The Three Kings Day, Friday 6, 2012. Have a nice evening. Wow! Thanks for making my day by featuring my blog! That has never happened to me before, I have already grabbed my button! Great bargains...ribbon is one thing I run out and get cheap...it sure makes a package look special. I do the same, Diann, red and green for the next 2 holidays. Being sick, I didn't get out to shop, but I have quite a stash to use up! I am running out of room. Happy Birthday to the Princess! I hope she enjoys all her thrifted treasures! These are such great ideas for buying now and saving later Diann....love what you found on clearance. I picked up a couple of things 50% off, I should have got some red and green candles...if I would have been thinking paddies day and valentines I would have...Maybe I can still find some, but I've really been waiting until stuff goes for 75% off, I'm such a cheapy (I mean thrifty person) ...there probably won't be anything left when I get out again though lol! This post was fun....thanks for sharing your ideas...the girly gift sets are adorable... I bet your little Princess is gonna love those! Thanks for the feature. I'm totally loving my jelly cabinet makeover and cant' wait to see everyone's thrifty goodies! Diann - many thanks for featuring my little bluebird jug on this week's party! Like you I like to stock up on candles at this time of year - good to get bargains! Hope you like this week's plate. I am always looking for decorations to use through out the year!! I did find so many things that I will be using around the house year round. Thanks so much for your visit and May I ask what type of things do you put in your Christmas Organization Book? I apologize if I missed it or forgot but did you do a post on your book? Diann, what great buys and great features! Thanks so much for hosting! Thank you once again for hosting I love your blog!!! thank you for hosting! great tips on the use of holiday sale items. I do that too. Come check out our family art gallery and link up some thrifty finds.